Hyperhidrosis, also known as excessive sweating, is a common condition that usually occurs in the palms of hands, soles of feet, scalp, face, and underarms. This extreme sweating can impact you on a daily basis, interfering with regular activities and causing you embarrassment. Luckily, you have options to stop this issue. Before you can understand how we treat this condition, it’s helpful to understand what causes hyperhidrosis. Most of the time there is no underlying health condition. This type of excessive sweating is referred to as primary hyperhidrosis and occurs when the nerves responsible for triggering your sweat glands become overactive. 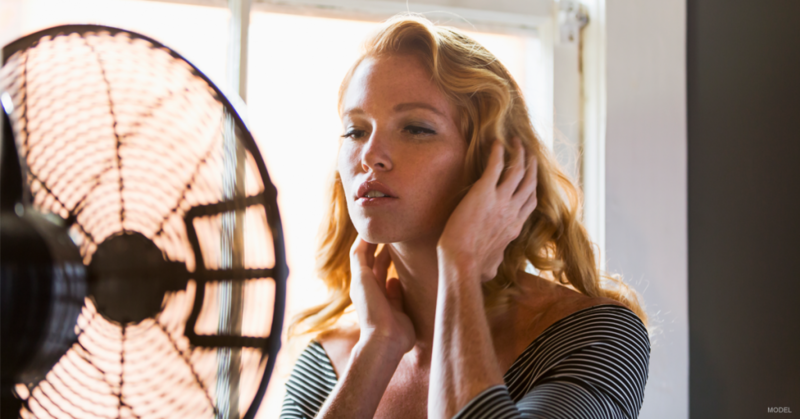 Excessive sweating can also result from an array of underlying medical conditions, including menopause, thyroid disease, fever, heat exhaustion, etc. This type is referred to as secondary hyperhidrosis. We offer 2 options to treat hyperhidrosis: INFINI™ and BOTOX COSMETIC®, both at our London, Ontario practice. INFINI decreases underarm sweat using radiofrequency energy combined with microneedling. Treatment only takes about 30 minutes and can provide long-lasting results. This procedure targets and reduces the size of sweat glands. It does not completely destroy the sweat glands but can significantly improve your hyperhidrosis. In this treatment, we start by numbing the area of concern. Once the topical anesthesia kicks in, we move the INFINI device across the armpit as the microneedles penetrate the skin and deliver bursts of radiofrequency energy. Most patients will see results after about 3 to 4 sessions. Treatments are done on a monthly basis. BOTOX can be a life-changing, temporary treatment for severe underarm sweating. This injectable treatment is a neuromodulator that is FDA-approved to reduce primary axillary hyperhidrosis. Small doses of this neuromodulator can temporarily block the nerves that stimulate sweating. When the sweat glands don’t receive these signals, they do not produce moisture. Patients often worry that they will become sweatier in other areas, but BOTOX does not cause the moisture to get backed up in your system or go through different channels of the body. The sweat is simply no longer produced in the treated area. Before treatment, we first perform an iodine test to identify the area of your underarm that produces sweat. We start by applying an iodine solution to the underarms. Then we powder the underarm with starch. Once you begin to sweat, the powder turns a dark color. We then administer BOTOX to the darkened area. There is no downtime associated with BOTOX; you can return to your normal daily routine directly after your appointment. You will begin to notice results within 2 to 14 days, and they can last anywhere from 6 to 12 months.